Celebrities Dicky Cheung (張衛健), Tony Hung (洪永城), Raymond Cho (曹永廉), Sisley Choi (蔡思貝), and Vivien Yeo (楊秀惠) gathered at TVB City to promote their upcoming drama The Learning Curve of a Warlord <大帥哥>. The promotional event was a grand affair as this is Dicky’s comeback series after a 20-year absence in the Hong Kong entertainment industry. To celebrate his return, TVB hired a marching band and military vehicle to bring Dicky out onto the stage. Both of TVB’s top executives Catherine Tsang (曾勵珍) and Virginia Lok (樂易玲) also made an appearance to show their support. In addition, there was a lion dance performance to bring the show good luck. In fact, filming another Cantonese drama for the Hong Kong audience has been on his mind for a while now. Two decades ago, he left abruptly after filming Journey to the West <西游记>, which skyrocketed his popularity. At the time, a sequel to Journey to the West was in the plans, but Dicky decided not to renew his contract with TVB. After he left TVB, he also left Hong Kong to further his acting career in Taiwan. It turns out The Learning Curve of a Warlord will be Dicky’s last acting project indefinitely. He shared there’s a lot of non-entertainment jobs waiting for him after he finishes the promotions for this series, which will be soon for him since he already participated in promotional events earlier on. He has plans to take on charity and church affairs during his acting hiatus. Obviously Dicky returned because TVB begged and guilt tripped him to come back. You’re not missing much, Dicky. With the way things are at TVB, don’t ever come back. Why is my comment under moderation? Anyway, back to the article….to be honest, I’m still quite ticked that D-icky agreed to come back in the first place knowing that the series TVB had in store for him would be crap (all he had to do was take one look at TVB’s track record and the fact that every single series which TVB had invited big name veterans back for the past few years have all sucked). Like I said awhile back ago when this series was first announced — the fact that TVB couldn’t even get a decent cast to support D-icky in this series (no A-list is fine but Tony Hung and Sisley Choi? talk about scraping the bottom of the barrel!!) shows just how much TVB truly “values” D-icky returning (NOT!!). I’m actually glad he won’t be returning to TVB anymore — wise decision if you ask me! @llwy12 So? without tvb, he is jus a nobody like u. Only 1 big star of jackie chan that got success without tvb in hk. It’s called mutual interests and gains from both parties. TVB also gained from D-icky acting for the station. He is also feeling grateful which is why he has returned.Not sure why you are making it sound as if TVB were performing charity work by promoting its stars…. @jimmyszeto i am only replying to those that condemned tvb for being ungrateful. Tvb without dicky will still be successful. But dicky without tvb will just become a nobody like u and me. Like i said the top stars in hk except jackie chan only without tvb to prosper. @jimmyszeto i am only replying to those that condemned tvb for being ungrateful. Tvb without d-icky will still be successful. But dicky without tvb will just become a nobody like u and me. Like i said the top stars in hk except jackie chan only without tvb to prosper. How about Tony Leung Ka Fai? @jimmyszeto Although Tony had never formally starred in a TVB television series before, the four-time Hong Kong Film Award-winning actor was a graduate of TVB’s artist training class of 1981 with Andy Lau (劉德華), and had worked as a body double for Chow Yun Fat (周潤發). @jimmyszeto so? without tvb acting class, he will know nuts about acting. tvb still produced 99% top stars in hk entertainment industry. I also think the ‘warlord comedy’ genre is crap. It should be a chinese new year drama like ‘The Days of Days’ when Sunny Chan and Sonija Kwok returned.. I agree, there was no business for D-icky to come back except for loyalty reasons. He had fame from starring in TVB dramas, but they also made a lot of money from him. It’s a fair employer-employee relationship. D-icky doesn’t owe them anything by returning while risking his reputation and body of work. In fact, he has far more to lose by starring in a TVB drama at this point in his career. In contrary to what some may think, TVB is not doing well. We both agree that they won’t be around for much longer. I watch every Cheung Wai kin drama’s And movies. But I like RayCho. He is now one of the strongholder in Tvb. I saw Zoë Tam. I think she is a good actrice. Het performance I had saw on the drama’s I had watch. I like her characters. You can see she is from backside now to the frontside. I think she deserve more mainrole. He ruïned Cheung bo chai story!! Love tvb back in the days now it’s just bad acting with good looking faces somewhat similar to China but China atleast still have some decent celebs left. Loved Dicky Cheung in A Journey to The West still remember watching that as a kid it was so funny. Most mainland actors today have gone through acting school. On the contrary, only a handful of new generation HK actors today have. Why did he leave to Taiwan at the height of his popularity? Actors haven’t start leaving tvb yet at that time. Over the years I have heard rumours such as contract disputes and Journey of the West was the most gruelling series he had ever filmed. I don’t think he was looking forward to jump into a sequel. 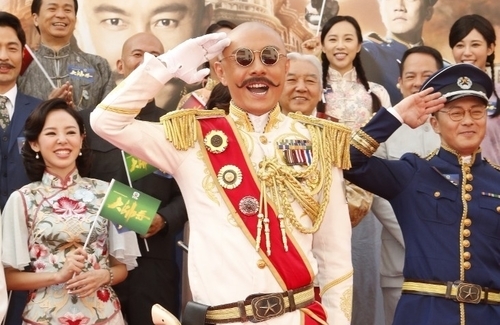 In hindsight, it was a great move but back then it must have been a big risk.Benny Chan gained massively from this…..
@jimmyszeto D-icky actually did an interview that was published in today’s issue of Mingpao Weekly where he talked about his reasons for returning to film the Warlord series. The main reason he returned was to pay back his debt to Catherine Tsang, who helped launch his career back in the 80s and gave him a crucial opportunity when no one else would. The other reason though, which he hasn’t mentioned until recently, is because he left TVB so abruptly back in 1996/97 when all audiences were expecting him to do JTTW sequel (and not just left TVB, but left HK entertainment industry completely) — he felt bad that he let all the audiences down and so he swore to himself that he would make it up to HK audiences someday. It wasn’t until a few years ago when he became a freelance artist (meaning he didn’t sign to any particular management company) and therefore had control over his own career, that he decided it’s time to give HK audiences the series he owed them. With the happenings in his private life an age sometimes celebrities realise that fame and continual paychecks aren’t everything. I have seen Asians work till their 60s and 70s even when have plenty saved, believing that if they stop earning then they might not have enough when older and retired. In the end they don’t stop until seriously ill. The western mentality displays more awareness in enjoying life and spending time with family…..
@jimmyszeto Yup…though in D-icky’s case, what he plans to do has more to do with his faith (religion) than anything else. The death of his brother (who was also a devout Catholic) earlier this year and subsequently attending his memorial service at the church opened his eyes to some of the things that he wanted to do as pertains to his faith, so that’s where he’s going to be putting more focus in the future (and a bit of a sidenote, but it makes sense now why D-icky attended Yammie’s memorial service last month and even did a reading at the service, despite the fact that he wasn’t close to her and barely knew her)…. @mike It was due to a contract dispute mainly….and actually it’s not true that actors didn’t start leaving TVB, as many did back then too, it’s just they went to Taiwan instead of China (because China’s entertainment industry wasn’t really “open” back then). Actually, artists leaving TVB en masse is nothing new — it happened in the 80s and 90s eras as well, it’s just that there were plenty of talented, capable artists back then who were able to fill the void so audiences weren’t affected as much. In recent years, there has been a severe shortage of talent in the entertainment industry so when artists leave TVB nowadays, the impact is more greatly felt.